How I Create My Client Inspiration Collages — Stevie Storck Design Co.
Over the years of running my own interior design business, I’ve refined a process for my client work that includes making Inspiration Collages. I create an Inspiration Collage after each new in-home Design Consultation as a part of the overall Project Guide and Proposal that is included with my consultation fee. I find they are a great tool for communicating my preliminary visions for the project and making sure designer and client are on the same page from the get go. I’ve gotten a few questions about how I make my Inspiration Collages lately and thought it would be fun to dive into my process and share some favorites that I’ve made recently! I make my collages using Keynote for Mac, but there are tons of program out there: Microsoft PowerPoint, Adobe Photoshop, Illustrator, there are even some phone apps that you can use to make something similar. First, I hit Pinterest to source some inspiration images. I actually prefer to start with images that are more conceptual in nature and not necessarily an example of the type of room I will be designing. I have a board I titled “INSPIRATION” for just this purpose. It includes little furniture vignettes, flat lays of materials, lots of photos of floral arrangements and gardens (I get so much color inspiration from these! ), fine art, textures, fabrics, architectural photos and landscapes. Really anything I come across that I want to hang onto, whether it portrays a mood and feel I’m drawn to or a color combination that I find really striking. Then I’ll go through my boards that relate to the type of rooms I’ll be designing, like “LIVING ROOM”, “BEDROOM”, “KITCHEN”, “DINING ROOM”, “ENTRY & FOYER”, “HOME OFFICE & LIBRARY”, “CHILDREN’S ROOMS”, etc. I like to look through images I’ve connected with already to see what that sparks in my mind. Then I’ll use Pinterest’s search bar to find more specific things to add to my collage, like “historic tile flooring patterns” or “rust velvet interiors”. Next, I pull out my fan deck and start choosing paint colors as references for the overall color scheme that’s in my head. Not all of these colors (and sometimes none of them!) will end up being actual paint colors for the room. If I was a graphic designer, I would probably pull out my Pantone swatches. As an interior designer, going off of paint swatches is just what makes sense to me! Sherwin Williams and Farrow & Ball are my go-to paint brands. I choose about 5-7 colors for each collage, including at least 1-2 neutrals in the mix depending on the project. I then copy color swatches off their websites and resize them to fit in my Inspiration Collage layout. Lastly, I play around with the layout of the Inspiration Collage until I’m happy with it! My goal is to make a collage that feels cohesive and visually balanced. So if I have two inspiration images that are similar in color tones or content, I try not to put them next to each other in the collage. For example, I won’t put two photos that include a couch right next to each other or if I do, I make sure they are from different angles. Another example would be two photos that have a strong color as the background. I try to dot these evenly around the collage instead of creating blocks of that color by putting them all in a line. The paint color swatches can also help balance the design out. For example if one corner of a collage has a lot of images with red in it, I will make sure to put the red paint color swatch in the opposite corner. The collage format I use is pretty simple to recreate! I make all the inspiration images and paint color swatches the same width so that I can fit them into a three column layout. Sometimes I end up cropping the individual images a little bit to make the arrangements work. So each of my Inspiration Collages are the same width, but they can be slightly different heights depending on how everything fits together. Here are a few favorites that I’ve designed recently. Click on any of the Inspiration Collages below to view them larger! And if you’re feeling super inspired by one, feel free to pin it to your own Pinterest Board! 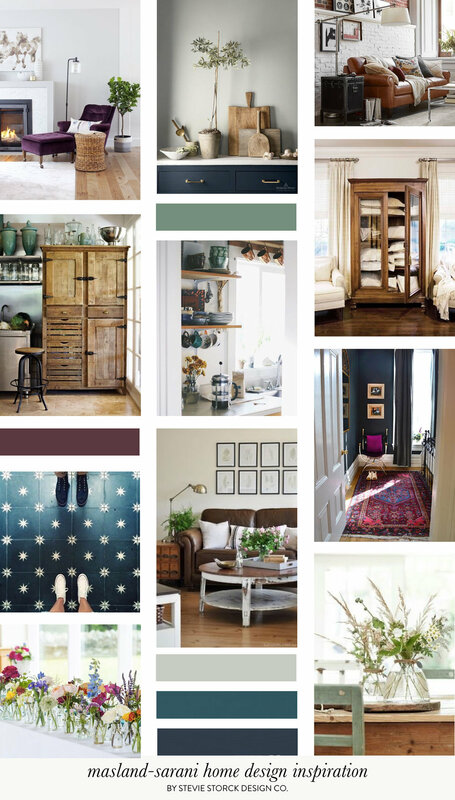 Would you try making an Inspiration Collage for your own home design projects? Let me know if you have any questions about my process! I would love to see the collages you make. Tag me on Instagram @steviestorck! To learn more about my interior design services, click here.